Now that 2009, a rather complex and unpredictable year has left us for 5 months. It’s 2010, the 2010th year of the Common Era or of Anno Domini; the 10th year of the 3rd millennium and of the 21st century; and the 1st decade of the 2010s. According to an article on CNN, 2010 is the year of Digital Distraction, due to more and more distractions coming from push emails, tweets, status updates, instant messaging, and more, that leads to a big question: productivity boon or bust? If in China, 2010 is the year of Tiger, in the tech world, 2010 will be the year of Tablet. A bevy of tech companies have teased, talked, and have not denied rumors that they are working on a fabled tablet computer, let’s say some Google-Android-powered and Google Chrome OS tablets, NVIDIA-powered tablet called “iTablet”, and many more. Some are not rumor anymore, we’ve watched a highly rumored Apple tablet since 2001, finally unveiled on Jan 27 named iPad and now become a mainstream. Microsoft and HP partnering in the development of a slate PC which’s announced at CES 2010 and now the effort is rumored to be cancelled, and instead HP is rumored starting to build a webOS-powered tablet codenamed “HP Hurricane” (as HP recently purchased Palm, the creator of webOS). 2010 is the third year of my company, DyCode. It’s exactly today, May 9, 2010, DyCode is three years old. Happy Birthday again, my child. They say, 3 years will be a turning point for a startup, whether it takes off or taken down. I hope for the best. Three years is no way an easy life for DyCode and my self. Both of use are tested over and over again. I’m recently offered to leave DyCode to fill a very prestigious position as a director in a subsidiary company (in Indonesia) of a biggest software company in the world. I’m sure you know what company I refer to, as it’s very close to every INDC members. Fortunately, I’m managed to turn down the temptation (after a long and deep thinking, with a little regret honestly), and stay with DyCode as long as it takes. What happened within DyCode recently before its three year, I’ll share below. For me and DyCode, we start this decade of 2010s with the new DyPlex. Yes, the new DyCode office. Since founded on May 9, 2007, DyCode stayed at the same home office, it was at Jl. Gemi No. 11A, Bandung. “Dynamic” is the first word of DyCode’s name. Dynamism is DyCode’s paradigm. It’s all about the ability to change or to adapt. DyCode is changing and keeps changing. It has more DyCoders, more assets, and more works. To adapt to those changes, there is a most basic thing that need to adapt, a place to work, a nicer and bigger DyPlex. The old DyPlex seems unable to handle the number of DyCoders, assets, and works. The search of new DyPlex was no way an easy task. Location, location, location, is the number one criteria. DyCode’s clients are mostly not in Bandung, they are in Jakarta, Cilegon, outside Java, or even abroad, hence the access to highway should be easy and fast. Programming is brain-intensive work and stress-prone, so the access to near cinema and entertainment center is important. But good location is useless when the building itself is not comfortable for working. A homie, spacious, good air circulation, abundant sunlight are must. We still choose a home-office, instead of office building in some business centers. DyCode wants its DyCoders to work comfortably, warm, and able to stay until late night if they have to. Setrasari is a well known area in Bandung. It’s the housing complex where the big houses located, and has a combination of nice neighborhood, quiet, and as cold as you never need air conditioner anymore. This map shows how the new DyPlex is reachable from Pasteur road, after highway exit gate. The route from a well-know and traffic-jam-causer mall in Bandung, Paris Van Java (PVJ). If you’re wondering how the new DyPlex looks like, I’ll post some photos. Admin guys room and a designer and CRO in it. You know whose room and workstation is this, the guy with Apple MacBook Pro, a Cinema Display, and gadgets, who else? We even have a dinning room, with free lunch, of course. We hire a chef (sort of) to prepare great lunch. It’s nice place to work, isn’t it? We’re really excited about it and love working here everyday. It’s the result of three years hard-works. We’ve come a long way from just a micro ISV with six people and working in a small home-office and limited facility, to this comfy office and good facility. If you’d like to taste it, come and join to DyCode. 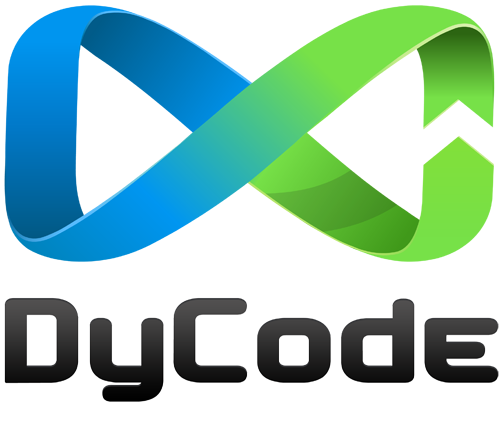 For past three years, DyCode has used the same logo. It’s very simple logo, I admit. I recall one day I delivered a training, a trainee asked me, “your company’s logo is just like that, sir?”. “Well, yes”, I answered. Glass effect was a trend at that time, so we adopted it. I’m sure we remember Vista used glass effect all over the place. The simple butterfly-like wireframe in the middle is actually the result of combining characters “D” and “C”, as the first characters of “Dy” and “Code”. Those “D” and “C” characters are not coming form English alphabet, instead, they are Futhorc, a runic alphabet used by Anglo-Saxons. The fusion of those two characters are illustrated below. The fusion result is then skewed and given a glass effect, and there you go, DyCode logo. We deliberately made the logo looked like a butterfly, as some of DyCode’s nature are inspired by butterfly. Logo perusahaan PT. Dycode Cominfotech Development menggambarkan kombinasi dari dua huruf yang merupakan inisial dari nama perusahaan, yaitu huruf D dan C, yang menyerupai simbol “infinity” yang memiliki sifat dinamis dan tak terhingga. Segitiga di bagian kanan logo, yang menyerupai tanda panah merepresentasikan sifat dinamis, sesuai dengan slogan perusahaan “Dynamic IT Solution For Optimal Business Value” . Kemudian sifat tak terhingga / tak berbatas dalam simbol infinity mewakilkan tidak adanya batasan bagi perusahaan dalam terus mengikuti perkembangan teknologi yang terbaru sebagai perusahaan IT (inovatif). Dua garis yang disatukan sehingga menyerupai simbol tak terhingga dengan ujung-ujung yang melengkung (bulat) dan tak terputus, melambangkan pelayanan (memberi dan menerima), sesuai dengan motto perusahaan: Take Enough, Give More. 1. Biru laut (Cyan: 0095ef) melambangkan sifat yang teguh, kokoh, kepercayaan, konservatif, keamanan dan teknologi. 2. Hijau Daun (Green: 77e148) melambangkan pembaruan. 3. Gradasi warna dari biru ke hijau: melambangkan adanya pembauran dan perpaduan dari arti kedua warna tersebut. Secara keseluruhan warna-warna pada logo mengandung arti bahwa selalu memberikan pelayanan yang dinamis, matang, dan sesuai kebutuhan solusi TI untuk mengoptimalkan nilai bisnis klien, serta selalu mengutamakan kepercayaan dan keamanan. Hal tersebut akan dicapai dengan pembelajaran secara dinamis, berinovasi, dan terdepan dalam penggunaan teknologi terbaru. By the way, we’ve registered the logo to Ditjen HKI, Departemen Hukum dan HAM (Law and Human Right Department of Indonesia). Wait for one year or more before it’s legally registered. So that’s all I can tell in this post. Once again, Happy 3rd Birthday to DyCode. As Vulcan always salutes, “Live long and prosper”. Movreak or Movie Freak is what movie freaks need, an app for supporting their addiction of watching movie at cinemas/theaters. Movreak app is used for viewing and sharing movies’ show time and place. You can browse now-playing movies, check the show time & places, and share to your friends by email or SMS. Or rather, if you’re stuck in place where there’s a theater nearby and you want to kill time by watching any movies there, then you simply just browse what movies are playing in that theater. Still, you still have a chance to bring along your friends to watch movie with you, by sharing the show time to them. Current version of Movreak only supports data for Indonesia country. In Indonesia, it’s hard to check daily movie schedule from all cinemas, there is no single dedicated website/portal for such information. Movreak will be your only source of movie and schedule information for all cinemas, both 21 Cineplex and Blitz Megaplex. More countries and cities coming up in the next version. We work really hard to make Movreak app has simple UIs, intuitive, easy to use, yet still pay attention to aesthetics. Theater. Display the list of theaters in selected city. Setting. Ability to change City (among other things), will instantly change now playing and theater list and show time. Integration with Facebook in a way you can’t imagine. Stay tune. To know more about Movreak and it’s recent stories, click here .